Where Can You Get 29% Per Year? Brazil. Luis Stuhlberger is a superstar Brazilian hedge fund manager. His big bets? US & European stock markets and the US dollar will keep rising. And developing nations (whose economies are commodity-dependent) are heading for more trouble. Investing in this guy’s fund in 1997 would have been the trade of a lifetime. Too bad we missed that. Bill Gross Calls this the “Trade of a Lifetime.” Selling German government debt was Gross’s big bet in April. But the trade still hasn’t taken off. One wrinkle in my master plan to take this trade: I have no idea how to make a bet that German bunds will decline. It all depends on inflation in Europe. Did Someone Say Inflation? Some analysts worry that Japan’s debt load is unsustainable. At some point the government will have to print money to issue new debt. And that would cause hyperinflation. And that would toast the Japanese economy. But look around the world: deflation, not inflation, is everywhere. Did Someone Say Deflation? Raspberry Pi released Pi Zero, a $5 computer that you can use for … well, I don’t know what the hell you can use this computer for. I wonder if I could trade from it? I’ve just ordered one and I’ll let you know. It’s a stunning achievement, to produce so much computing power for such a low price. Did Someone Say Low Prices? Oil prices fall. Middle Eastern countries drill for even more to sustain their government spending. So oil prices fall farther. It’s a deflationary cycle that feeds on itself. Oil could drop to $30 a barrel or even lower in 2016. 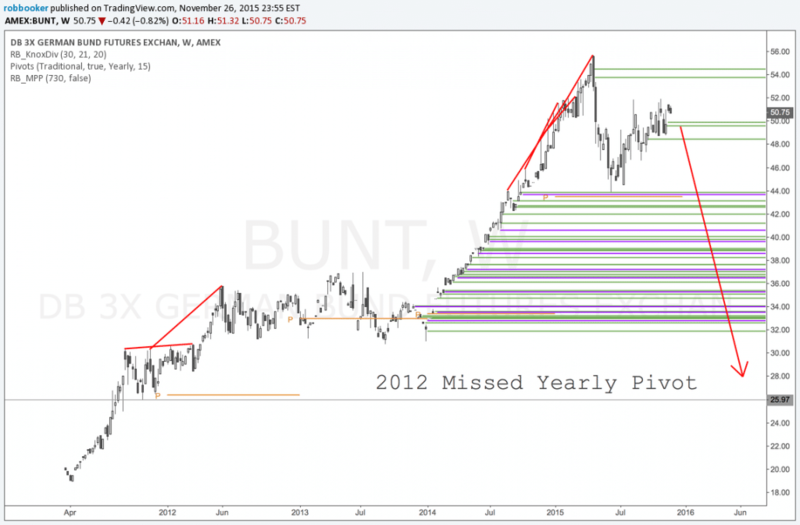 The German Bond Trade: I’m not even sure this ETF (BUNT) is tradable. But it’s got a juicy (and huge) missed yearly pivot target below.